Western blot analysis of extracts of various cell lines, using DNMT3B Polyclonal Antibody at 1:300 dilution. 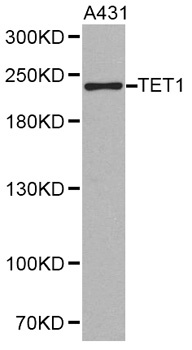 Secondary antibody: HRP Goat Anti-Rabbit IgG (H+L) (AS014) at 1:10000 dilution. Lysates/proteins: 25ug per lane. Blocking buffer: 3% nonfat dry milk in TBST. DNMT3B has been demonstrated to methylate both unmethylated and hemimethylated DNA equally and is supposed to mediate de novo methylation together with Dnmt1. Increased activation or amount of Dnmt3b is believed to be involved in carcinogenesis, as well as other genetic and epigenetic diseases. 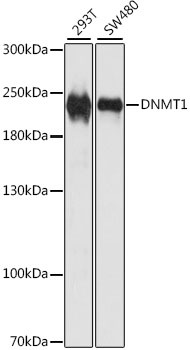 DNMT3B Polyclonal Antibody. Unconjugated. Raised in: Rabbit. Wanga XZ et. al. (November 2018). Peperomin E Induces Promoter Hypomethylation of Metastatic-Suppressor Genes and Attenuates Metastasis in Poorly Differentiated Gastric Cancer. Cell Physiol Biochem. 50(6):2341-2364. Qiao X et. al. (June 2017). 5-Aza-2'-deoxycytidine in the medial prefrontal cortex regulates alcohol-related behavior and Ntf3-TrkC expression in rats. PLoS One. 12(6):e0179469. Zhang Q et. al. (October 2016). Rhein reversal of DNA hypermethylation-associated Klotho suppression ameliorates renal fibrosis in mice. Sci Rep. 6:34597. Vottero A et. al. (December 2011). Evidence for epigenetic abnormalities of the androgen receptor gene in foreskin from children with hypospadias. J Clin Endocrinol Metab. 96(12):E1953-62. Socha MJ et. al. (February 2009). Aberrant promoter methylation of SPARC in ovarian cancer. Neoplasia. 11(2):126-35. Kameda T et. al. (November 2006). A severe de novo methylation of episomal vectors by human ES cells. Biochem Biophys Res Commun. 349(4):1269-77.